We’re in the news again, along with many other cities, towns and villages, as heavy rain again brings floods. Above is a photo taken around 6pm yesterday from Scarborough Bridge, looking towards Lendal Bridge, with the river looking massive. The river level is due to peak sometime later today. The ings by the river were doing their job, taking some of the floodwater that otherwise would be a few inches nearer the front doors of many riverside properties nearby, downstream. Gulls had settled on the river water in the expansive ings. Machinery whirred in a mysterious concrete structure on the flood bank. 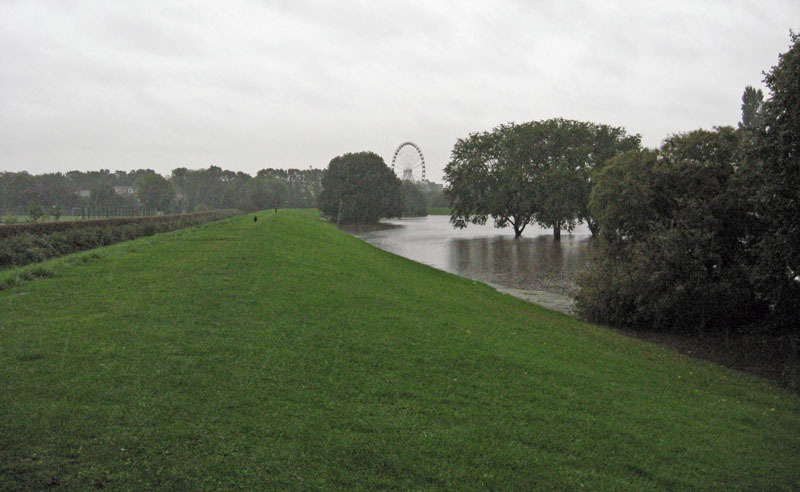 On the opposite river bank is the Leeman Road area, which was in the news during the serious floods of 2000, when there were fears of the flood waters breaking the defences. I remember we wandered down here that night, in the dark, and stood on the flood bank on our side. We could see lights, and hear raised voices from across the river, as emergency services and residents struggled with sandbags. This (rather dull) photo shows the slope down to the river alongside Clifton Bridge. The detail I wanted to capture isn’t really visible, but seemed significant. 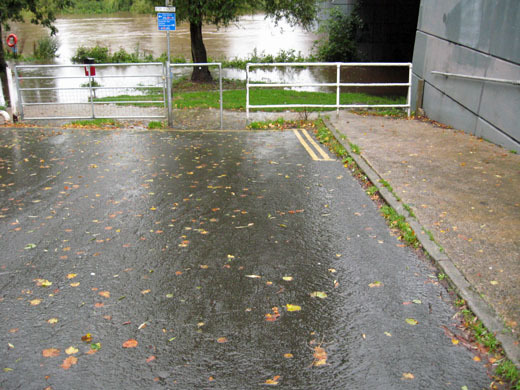 A visible stream of water was heading towards the river from this roadway, from its right-hand gutter marked with the yellow lines. A rather dramatic rivulet, originating from the road above, flowing down the conveniently smooth tarmac, into the burgeoning Ouse. One of those moments when you see clearly what you’ve read about in theory. Before this convenient bridge was built the land around it was more permeable, I imagine, and took in rain like the soil in my garden takes in rain. Now there’s nothing here to absorb that rainfall on this slope to the river, but there’s still a slope to the river, and now it’s smooth and covered in tarmac. So the water keeps flowing, into the river. I passed two young children, out for a walk with their dad. The girl was momentarily fascinated by the fast-moving rivulet, stood over it and called it a ‘road stream’. So many roads, and driveways, so much land built on, so many ‘road streams’ heading for the rivers. 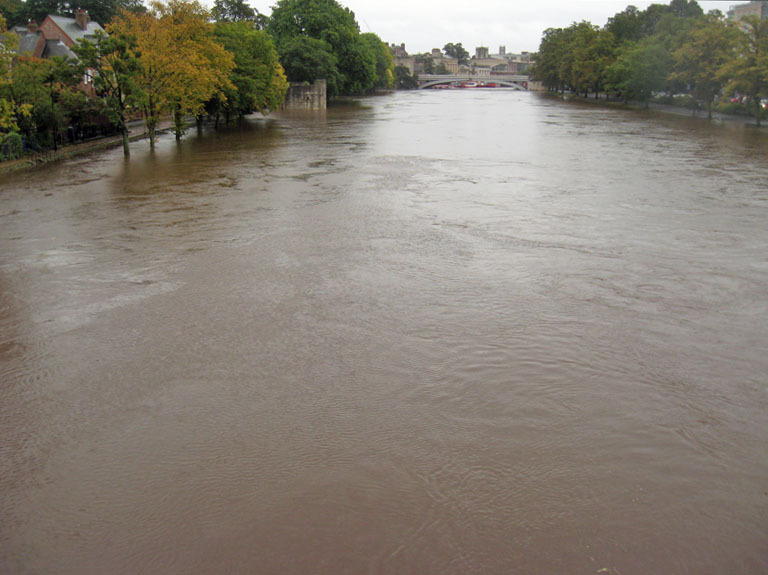 Local water mixing with the rain brought down from the Ouse tributaries of the Nidd, Ure and Swale.